Bet on the NFLToday in Dallas, Football fans are struggling to get into town for the game. 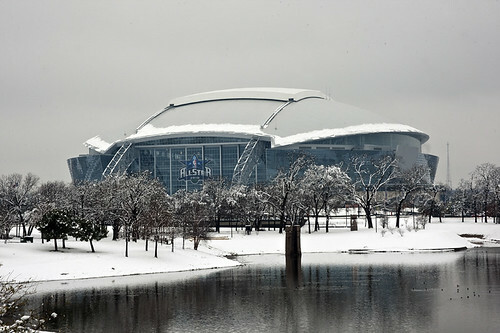 An unexpected snow storm blasted through Dallas last night, just two days before the big game. This amount of snow and ice was easily enough to shut down many roads and even the airport, canceling nearly 1000 flights. Dallas isn't alone, with the city of Chicago shut down by bad storms just one day earlier. Weather problems in these two big cities have effected travelers all over the world, causing delays to and from many world wide airports and forcing people to change plans. Cars in Chicago were abandoned and freeways literally became temporary parking lots. Luckily, in Dallas, things didn't get quite this bad, but it will still effect super bowl travel plans. Even though there were less than 8 inches with the latest storm, Dallas drivers are not as prepared for the snow, so this type of storm, with ice and snow is especially bad in Texas. The last few weeks have been tough for Dallas, with unexpected storms and extremely cold temperatures. Super Bowl XLV will be held in the Cowboys Stadium, which will be fully protected from the rain, snow, or ice, with retractable roof. 90,000 people are expected to attend, even if they have to walk through snow and ice to get there. The stadium is only two years old and cost a whopping $1.3 billion to build. As of Friday evening, the airports are back up and running, but many flights were canceled or delayed earlier in the day because of the icy conditions. Airport officials have pledged to do everything possible to try and get everyone through the airport in time for the game on Sunday. The Pittsburgh Steelers vs. Green Bay Packers will be held this Sunday, February 6, 2011 at 6:30pm ET and will be televised on FOX. Super Bowl betting Props Lines are live on Betroyal.